^ Milanich, Jerald T.; Milbrath, Susan (1989). "Another World". In Jerald T. Milanich; Susan Milbrath (eds.). 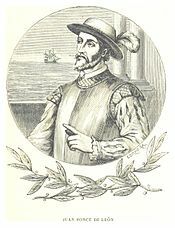 First Encounters: Spanish Explorations in the Caribbean and the United States, 1492–1570. Gainesville: University of Florida Press. pp. 1–26. ^ Fuson, Robert H. (1988). "The John Cabot Mystique". In Stanley H. Palmer; Dennis Reinhartz (eds.). Essays on the History of North American Discovery and Exploration. College Station: Texas A&M University Press. ^ Kelsey, Harry (1998). "Spanish Entrada Cartography". In Dennis Reinhartz; Gerald D. Saxon (eds.). The mapping of the Entradas into the greater Southwest: symposium papers based on the symposium "Entrada: The First Century of Mapping the Greater Southwest" held at the University of Texas at Arlington on February 20, 1992. Norman: Universty of Oklahoma Press. pp. 56–106. ISBN 978-0-8061-3047-7. ^ de Arredondo, Antonio (1925) [written in 1742]. "Chapter IV". In Bolton, Herbert E. (ed.). Arredondo's Historical Proof of Spain's Title to Georgia: A Contribution to the History of One of the Spanish Borderlands. Berkeley: University of California Press. pp. 149–154. Retrieved 2017-03-22.